This week's run report is brought to us by tourist runner Claire Allison who normally runs at Longrun Meadow. I’ve been promising myself that I’ll make it to Weymouth parkrun for about six months. The last time I was here, I had to attend a course which started at 9am on a Saturday, which obviously was quite a ridiculous time to start a course on parkrunday… Clearly the course organiser needed educating! My dad worked in Weymouth when I was a child so occasionally my mum and I would go with him for the day, and spend it at the beach. Driving along the beach road on our way in this morning, brought back happy childhood memories. My parkrun buddy and fellow tourist from Longrun Meadow told me that the last time she was there, she’d seen a little yellow legs. I’m assuming that was a bird, although there is always the chance that she meant a runner wearing yellow high-vis running leggings I guess? Lodmoor Country Park, where Weymouth parkrun is held, is a Site of Special Scientific Interest and RSPB reserve. The SSSI has a wetland habitat, according to Wiki, which is home to native rare birds, presumably the little yellow legs is one of them? Rare insects can also be found there, including my favourite, the short-winged conehead. First timers brief is held at the far end of the car park and the start is close by, all very easy to find for a newbie. There are pacing signs along the start funnel, giving you a clear idea whereabouts to start according to your expected finish time. 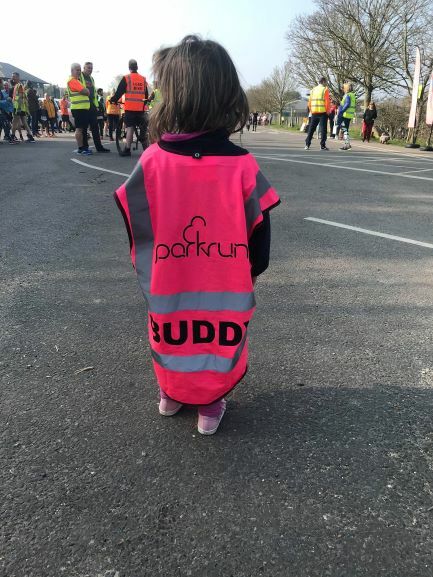 A great idea, but the only downside to this was the inability to hear the run director giving the run brief prior to the start as we were towards the back. This was a shame as I would have loved to have known why and who we were clapping! 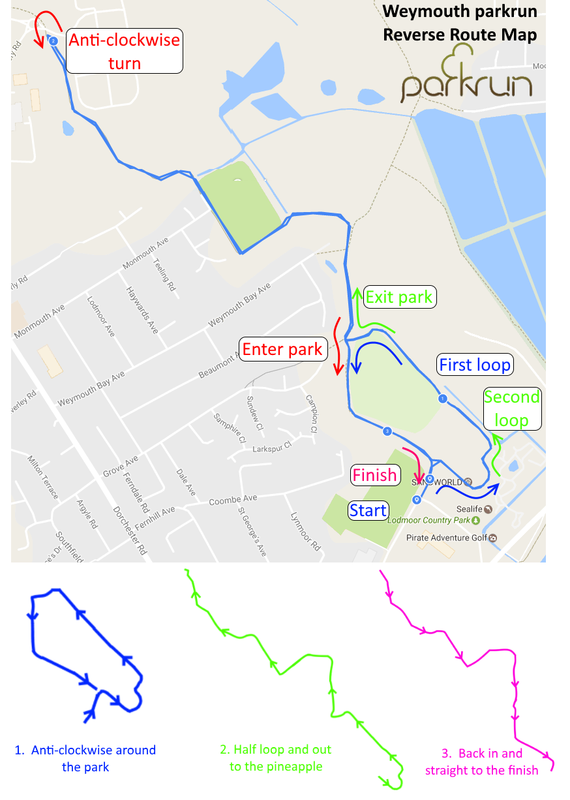 Road shoes are absolutely fine for the course, which consists of two small laps, then an out and back straight section towards the park and ride, around the pineapple and back again. In essence the route is shaped like an upside down balloon with a long piece of string. Albeit a bit of a deflated balloon, but it’s always fun to work out what a new parkrun route resembles. 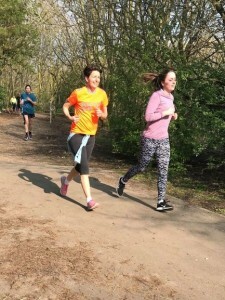 Ours looks like a duck I think… Part of the joy of this parkrun however is the out and back section. This gives parkrunners the chance to high five or wave at friends as they pass each other. I nearly missed my friend as she was heading back as I was too busy looking at my garmin. All of the marshals were encouraging and enthusiastic, and I especially liked the one who told me it was less than a kilometre to go! When I was stood at the start, waiting to go, I heard talk that there was a 500 club tee shirt present. 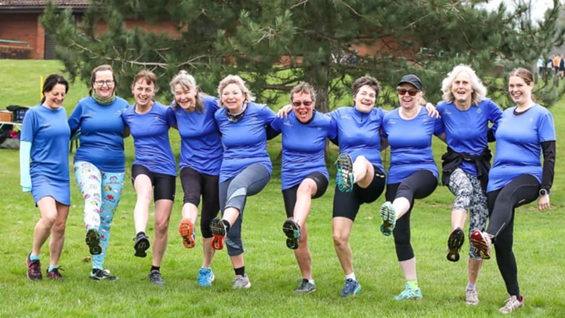 I found this incredibly exciting, as I had only just read on facebook about ten of the eleven ladies in the 500 club all meeting up last week at Basingstoke parkrun for the first time. To think that one was there today was great! Although at that point, I didn’t know if it was a man or a lady who belonged to the shirt. Afterwards I went to say hello to the run director, to find her talking to Suzan from Bushy Park, owner of the 500 shirt! Suzan was lovely and friendly, and really happy to talk to us both. 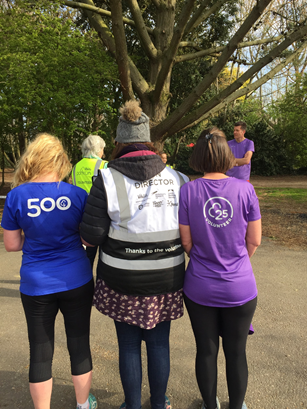 500 parkruns is a massive achievement, and from my brief search I could only find 51 people in this club! The parkrun website states that in order to get into this club, you need to have run every week for just over 9.5 years! Pictured are ten out of the eleven 500 club ladies at Basingstoke last week. Above, the lovely Katherine Davis, RD for today, Suzan Baker and myself. Moving on from one lot of numbers to another. 468 people walked, jogged or ran their way around event #294. This is the 5th highest amount of participants in the history of Weymouth parkrun. Alastair Falconer finished first today for the men, in 17:19. Alastair was a first timer from Croydon. First over the finish line for the ladies was Alex Door from local club Egdon Heath Harriers. Her 20:02 time was also a PB for her, so well done both! Ruth Barnes holds the female record of 17:09 whilst Phil Wicks holds the male record with 14:47. There were 78 first timers to Weymouth today, so hopefully if you’re on holiday down here in Dorset, you’re having a good time! 88 people got a PB today, so another massive well done to you all! 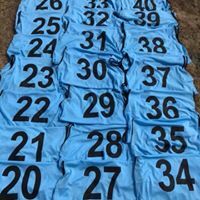 Looking at the results, I see that David Malplas is two away from earning his 250 tee shirt, whilst Egdon Heath runner Kim Fudge celebrated her 100 today! Darren Pearce and Jackie Moon will be sending off for their 50 tee shirts after today, and Harry Hudson did his 11th today, hopefully in his new 10 tee! 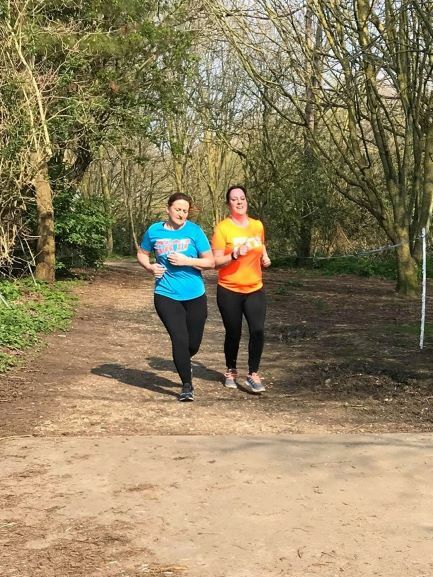 Lastly a big well done to the 27 people who started their parkrun adventure today, you are all amazing, and I hope you are looking forward to your next parkrun. Special mention to Martha Roberts who did her first 5k parkrun today. She already has an impressive 57 junior parkruns under her belt, as well as the purple 25 volunteer tee shirt ( or eggplant as it is described on the packaging!) but it’s a big jump up from 2K to 5K so good on you Martha! Tim ABBERLEY, Rachel ABEL, Nigel ARTHUR, Richard BIBBY, Sarah BIBBY, Chris BURT, Asa CARDIFF, Peter CHRISTIE, Judy CLARKE, Alan CLARKE, Katherine DAVIS, Sandra FRANCIS, Elisabeth GOWER, David GRIMMETT, Graham HALDWELL, Sacha HATEBOER, Gary HEDGES, Sian HOLTOM, Ruth KIRBY, Hector KNIGHT, David LLOYD, Claire MAY, Lauren MCCALLAM, Michael MCDOWELL, Max NEILSON-HOWES, Fiona PAWSEY, Chris PERRETT, Heather RAY, Arthur RAY, Michael SEWRY, Norma SMART, Kelly TUPLIN, Norman WHITE. I’ve rambled on long enough, so thank you from two Longrun Meadow tourists, we loved your parkrun and will definitely return. If you fancy a two lapper that looks like a duck, head over to Taunton sometime, you’ll be very welcome! 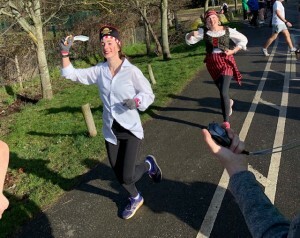 On Saturday 6th we'll be running the course in reverse - why you may well ask.... well for a bit of a fun, and it is the closest 'free' run to April Fools day (as we had pacers last weekend). Please take time to familiarise yourself with the route to avoid looking like a wally when you run in the wrong direction. Keep to the right hand side of the paths when on the out-and-back section around the Rugby Club. Those running with a dog might wish to practise the route beforehand so your hound doesn't drag you in the wrong direction. 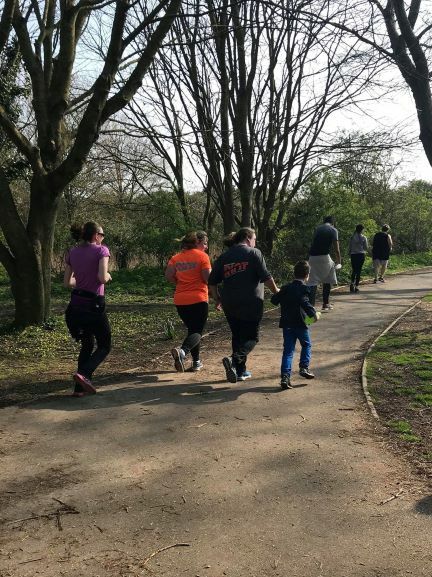 Please remember that while other park users are more than likely aware that parkrun is taking place on a Saturday morning, they may well not know that the route has been reversed this week, so give additional consideration to everyone you met. 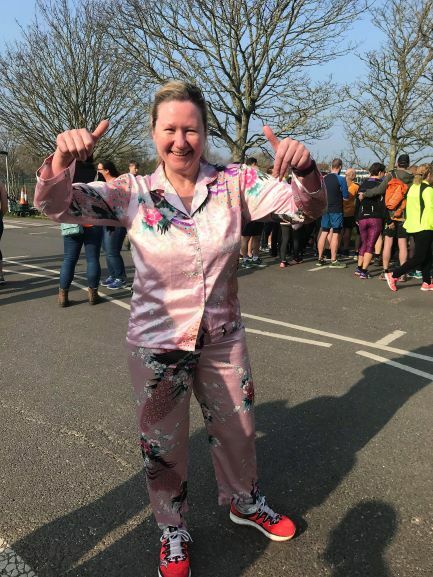 Parkrun in your pyjamas that’s what the brief was for Saturday 30th March. National Wear Your Pyjamas To Parkrun Day. In essence this could be interpreted to rolling out of bed straight into your trainers and going for your run. 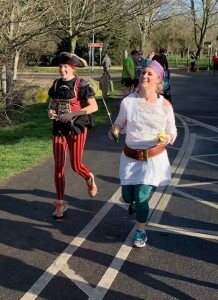 Those that ran in their pyjamas looked awesome. Pyjamas aside this week also saw a ‘takeover’. 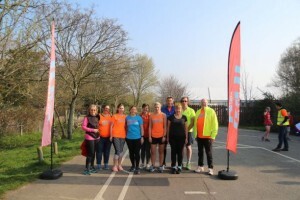 Local running club Dorchester RIOT took over nearly all the roles on the volunteer rota for a second time. 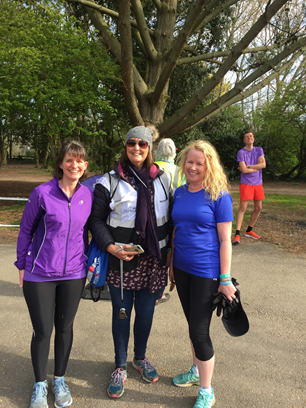 Alongside marshalling duties they also saw their most recent coach to 5k graduates complete their first parkrun. A sea of blue, orange and grey tops darted amongst the regular runners many supported by existing RIOT members. 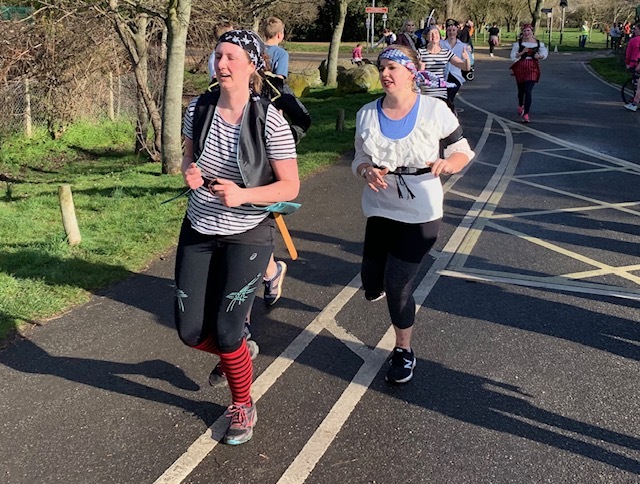 The encouragement they received from regular parkrunners and supporters was brilliant and would of no doubt given them the necessary boost. 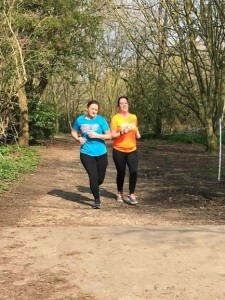 I spoke to a few of the graduates and they said the parkrun was a great conclusion to their c25k course. Joining the 10 club was Florence Richardson. And in the 100 club was Monica Rankin & Samantha Barrington. It was the 292nd Weymouth parkrun. 58 First timers, 26 running clubs represented and a grand total of 478 people completed the event. That’s the 3rd highest attendance. 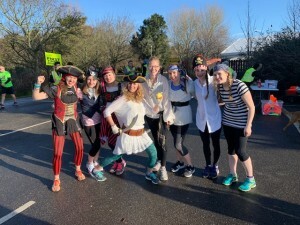 56 people volunteered to cheer, encourage and champion those running. 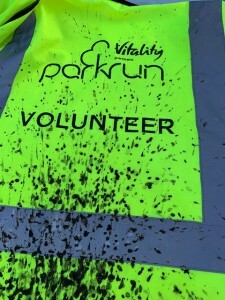 Up and coming events at Weymouth parkrun. Next Saturday 6th April parkrun route will be a reverse of the regular course (this is not an April Fools joke). Another much anticipated and much talked about event is ‘Star Wars parkrun’ on May the 4th. People are encouraged to wear their best Star Wars outfit to celebrate the fact parkrun falls on the 4th of May - May the 4th be with you. 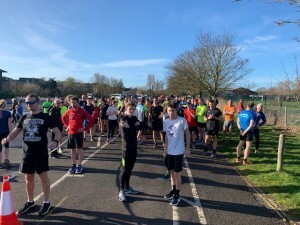 The start of March saw the return of the Weymouth parkrun to Lodmoor Country Park after a two month departure to the sea front with its blustery conditions. Runners were greeted by sunshine overhead trying to dry up the puddles from recent rain. As the runners gathered near the start line, some people having done a small warm up jog and stretches, others warming up with a chat with friends, it became apparent that there were some fancy dress pirates amongst this week’s runners as part of a Hen weekend. Well done to them for bringing a smile to many people’s faces. The formalities done, including a round of applause for those achieving milestones and for the volunteers, the run/jog/walk began. I am sure the front of the race went off fast but from where I was it was a gentle jog around the first bend and through a few puddles as we headed passed the play equipment. Spring was blossoming as we looped through the wooded part of the course and around the miniature railway track. Finally the pack began to spread out slightly as I moved on from the 1km marker with the rugby club as my next mental marker. Thankfully it was not as windy as it can be at times as I went from the gravel paths of the park and onto the tarmac drag up towards Sainsbury’s. As always there was a very supportive atmosphere amongst runners. By this time the faster runners were going the other way and were heading back towards the park. A quick turn by the pineapple and we all strode forward on the downhill section heading home. The 3rd and 4th km passed and the finish line neared. Inevitably as the finish line approached, some people were tiring and others speeding up. Personally I crossed the line having run with some of my family and I think it is this that makes this weekly run so good. It caters for all, whether you are fast or not so fast, whatever your personal reason for taking part. Well done to all those who ran, jogged, walked or supported at today’s event. 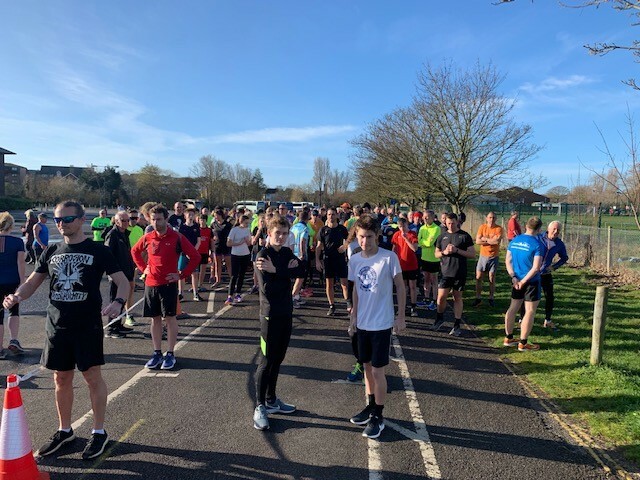 If you are reading this, as a potential visitor to the Weymouth parkrun in a future weekend then please come down and join the run no matter what your ability. You really will be welcomed. A big thank you to all the volunteers who allow this event to go ahead. If you haven’t volunteered before please give it a go and give something back to this fantastic event. 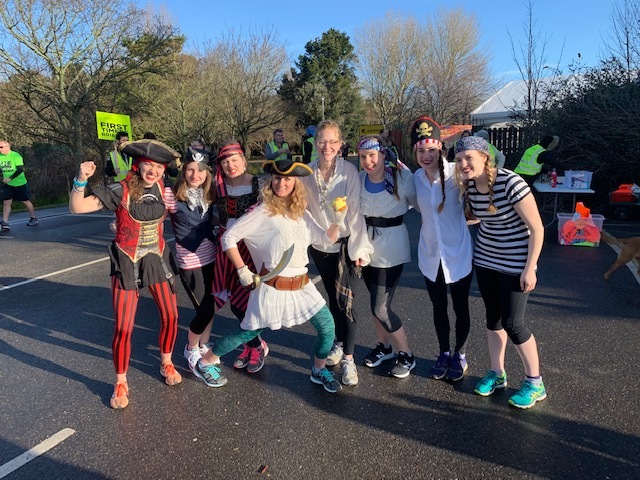 Our amazing team of 36 volunteers enabled 390 runners to partake, of which 39 were first timers (possibly a few pirates there! ), and 39 PBs were also achieved.... maybe the park is faster than the seafront - who would have thought it! This weeks results can be located here and the full result set of Weymouth is also available. The work is continuing on the prom so from Al Molo to the cone turnaround and back you will be running on the beach. This is just under 0.5km but if you are running with a buggy you may wish to swap to off road wheels!